The definition, the best clamshell heat press has different meanings depending on your needs and price. Whether you are a hobbyist, home or small business you probably have different requirements and budget in mind. 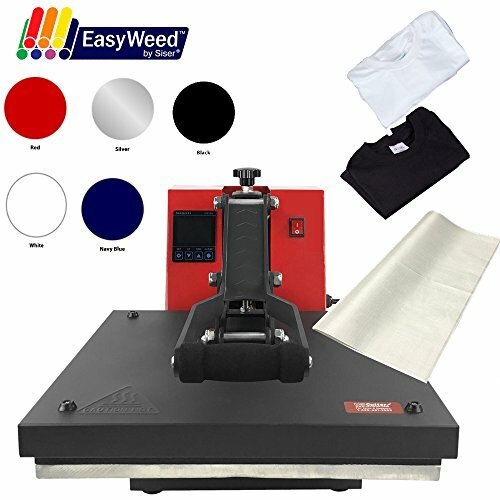 We aim here to cover best entry-level clamshell heat press, some mid-range as well as high-end presses that are suitable for pressing t-shirts, pillows, onesies and other flat items. If you are looking to press hats, cups, mugs or plates then check out our other article on multifunction heat presses. For hobbyists and small business users, you are most likely looking for a cheap entry point to heat transfer and making t-shirts. We have a number of recommendations for you to suit your budget and startup needs. If you are starting out then the US Cutter is a wonderful deal to get you pressing right out of the box. 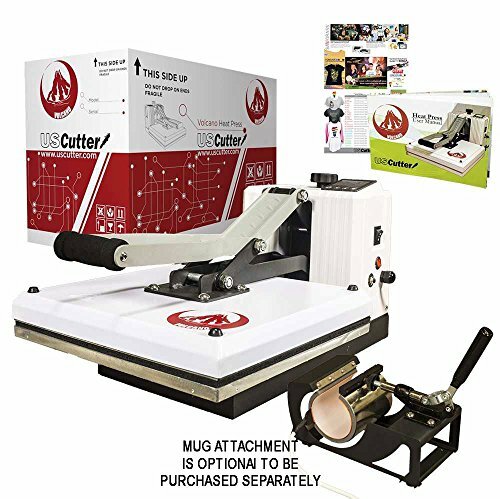 The heat press comes with two sheets of heat transfer vinyl (HTV) as well as two t-shirts and a non-stick Teflon sheet to protect your shirts and design as you press. US Cutter provides US-based support and has a great following. They also sell vinyl and other higher end presses including auto open presses and multifunction presses. As their lower end starter press, this represents the best value deal and a thumbs up from us. This is probably the lowest price entry point for those looking for a clamshell heat press. For around $150 right now you cannot find a better deal on a 15″x15″ heat press. 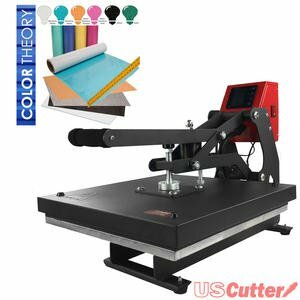 Cheaper presses from this price point and down are 12″x15″ heat platens which, while they work fine, they may present issues if you want to press larger garments or designs – you will have to double press. The FancierStudio press is a sturdy build, well reviewed and popular press in the crafting groups online. If you are on an absolute budget then this is THE press for you. This quality-wise is a step up from the press above and from personal experience, it is a fantastic press. If you are in the craft groups on Facebook both for Cricut and Silhouette, this is the most recommended heat press by far. To add to its accolades it is Amazon’s best selling heat press with solid reviews and ratings. It is a close call between this press and the US Cutter press, the latter probably wins out based on the local US support and bundle options which are a huge plus if you are just starting out. This is a little more expensive than the above models but it differs in one important area. The US Cutter Volcano press is a regular clamshell BUT it has an additional hookup for an optional mug press attachment. This gives you more flexibility to make cups but retains the solid construction of a clamshell. The optional mug press attachment costs an additional $79.99. US Cutter offers US-based support. Seriously check this press out if you plan to make more than shirts. It is feasible that US Cutter could release an optional hat press too. These heat presses offer more functionality like auto open and larger heat platens as well as local US support from companies like US Cutter and Hotronix. 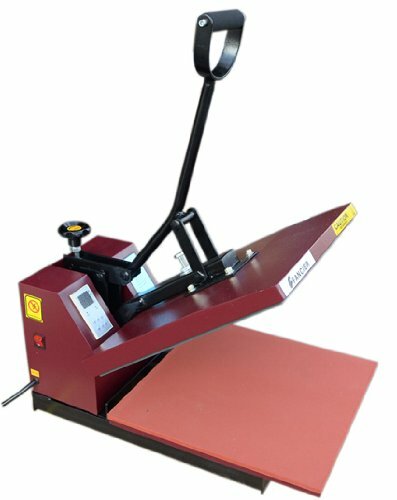 This is a heavy duty commercial grade heat press. Unlike the manual heat presses, this clamshell will automatically open the press once the timer goes off. If you are busy working large orders this function is a huge plus as you can set and forget your press and it will release ready for the next shirt while you multitask and concentrate on getting the next shirt ready. This auto open heat press will streamline your pressing process. Like the entry-level model above the auto open press comes with 6 sheets of heat transfer vinyl (HTV). If you are into making larger designs and want to press XXL and larger shirts, pillowcases, sheets, milestone blankets then this is the press for you. Offering a huge 16″x24″ heat platen you will be able to press designs that max out your Cricut or Cameo’s design limits! This is a big step up in price but also performance. The Hotronix presses are heavy duty commercial grade presses. The Maxx features superior heating elements which ensure that you have consistent and accurate temperatures across your heat plate with no cold spots or variance. The price jump between these presses and the other midrange is high but this is due to a much superior product with fantastic local support. If you are getting into the business and wanting to invest in a heat press that will last through the years with consistent professional results this is the starter press for you! These are the presses if money is not an issue and you want the best presses in the industry with commercial grade build quality and longevity. These presses are a business investment that will provide consistent professional results day in day out and have local US support should you have issues with your press. 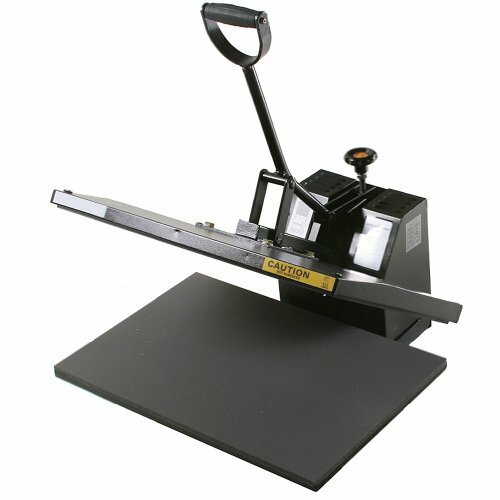 This commercial-grade heat press offers a larger 16″x16″ heat platen with magnetic auto-opening. The timer resets when the press auto-opens ready for the next item to help streamline your pressing process. The Hotronix features digital time, temperature and pressure controls, Twin TimerTM for programming two independent time settings, Auto Sleep Mode as well as magnetic assist lock-down. This press also has a wider opening to help you lay down your design without getting caught on the heat element. The heat plate is also Teflon coated for protection. Now we are into serious presses. These are actually swing away not clamshells but are the top of the line heat presses. They offer touch screen control of temperature, time and pressure. The Teflon coated heat platen swings away from the plate and additionally, the tray slides towards you so you can better place your design away from the heat source. You can program your heat, pressure and time preferences into memory on this press so you can switch between settings quickly and reliably press using the correct temperature and time every time! The Maxx also features auto-off functionality. As with the press above you have the touch screen control, multiple programmable settings, swing away, slide out drawer functionality. 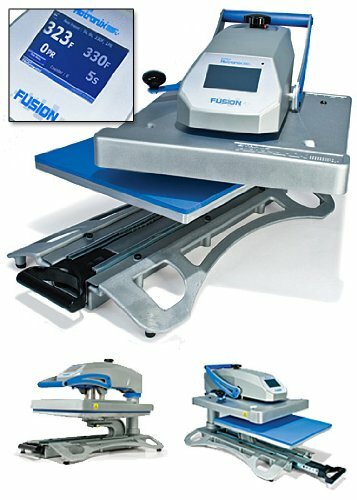 The difference with the Fusion Air is that it comes in a tabletop format and features auto open. We are Amazon affiliates. Links on these pages do earn us commission on orders placed BUT this does not affect the price to you! We hope and appreciate that you find our advice and reviews useful and worthy of a click-through order to Amazon!